As the year 2016 is approaching to its end, Hakko had issued the updated edition of their product catalogue for the Europe. 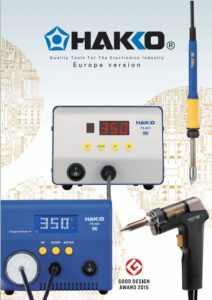 You may find in this catalogue the recent information on Hakko’s actual product range, available for the European markat, as of November 2016. As the range is continuosly changing, don’t forget to visit our website time by time, as we try to keep you up-to-date with all the recent changes. Hakko still remains one the companies that most dinamically change and improve their range, to meet their customers’ needs. You may access this catalogue either on-line, clicking the image on the left or on the “Hakko Catalogue 2016” item in the menu bar above, or downloading it to you computer from our Downloads page. In case you need a hard copy, just contact us and we will send you one by mail.